Should you breed this extraterrestrial? Alien Breed is an isometric shooter in which you step into the rugged boots of yet another space soldier. Yes, that's the norm with most of our modern space epics, but bear with us. After completing some inaugural patrol work and advancing with marching orders to investigate an eerily silent research center, you head with some trepidation toward ISRC-4 (the center in question.) As you infiltrate the terrifyingly empty space structure, you're quickly greeted with all the makings of an alien infestation. Game over, man! Game over! Actually, that's just the start of the game. Now that you've established a viable reason for all the radio silence, you've got to clear it up, like some sort of nasty infection. As you wander through the dark, twisting corridors rife with bloodthirsty aliens and their larger comrades, you'll be assaulted from all sides. Though the situation initially looks bleak, you're actually in control, with plenty of viable weapons with which you can partake in an alien exterminating spree. It's all standard fare: machine guns, explosive weaponry, rockets -- you name it. The H.R. Giger-inspired baddies will succumb to even your lowliest firearm if you know how to use it, and that is often and in all directions. As you progress they'll only keep coming for you, so it's best to stay on guard at all times. 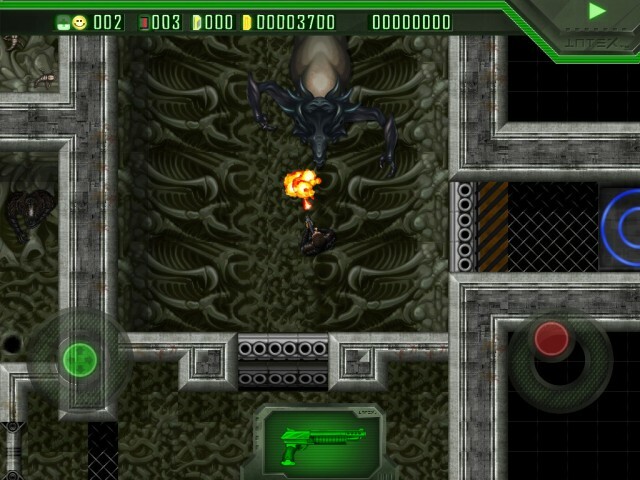 While the original Alien Breed felt great with its tangible controls, this mobile edition is a bit fiddly and it can be difficult to get used to, especially if you grew up with the game and miss the original tactile feeling of aiming, and letting go. It feels a bit odd here in its mobile translation. If you've played through the modern Alien Breed episodes and your mobile devices are crying out for a little Giger-inspired love, grab this diamond in the rough and get to slaying some alien scum -- no power loader required.